If you are moving locally in Herefordshire, across the Three Counties, the UK or internationally, we will have a moving solution to meet your needs. We can tailor our service from direct removal service only, to providing a part or full specialist packing service ensuring a smooth, efficient move to your new home. The Black and White House Museum is a beautiful example of 17th-century architecture. 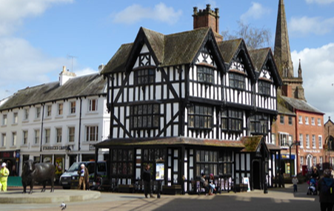 It stands in the center of Hereford and is a stark contrast with its modern surroundings. Hereford, Leominster, Bromyard and Ross-on-Wye are all picturesque riverside towns. There’s plenty to do and lots to see, why not relocate! We have all types of Hereford Storage options in place, whether you require Container Storage; Self-Storage; Internal Storage; External Storage; Holdover Temporary Storage (14 days or less), our team will be pleased to help you find the best solution to suit your storage Hereford requirements. Our friendly customer service team will be more than happy to talk you through your options. Give us a call on 01684 892236. Tight on time? Our packing service helps get you packed up faster - whether you need our full packing service or a fragile pack, we can tailor our services to meet your needs. As part of this service, we use our specialist materials to undertake packing that perhaps you don’t have time to do, or which you physically can’t manage, or you would like it done professionally - we will do it carefully and quickly. Ask us for a packing services quote, you might be surprised at the low cost of this service, one less thing to worry about before your move. If you're looking for removal companies Hereford, who are reliable, efficient and trustworthy, we are the answer.